For someone who lives and works in Baltimore, a disproportionate amount of my recent reviews have covered Washington DC in lieu of my hometown. It's been a while since I did some culinary sleuthing in Charm City, but was craving Thai food, which called for a new expedition to find a gluten-free restaurant in my home city. 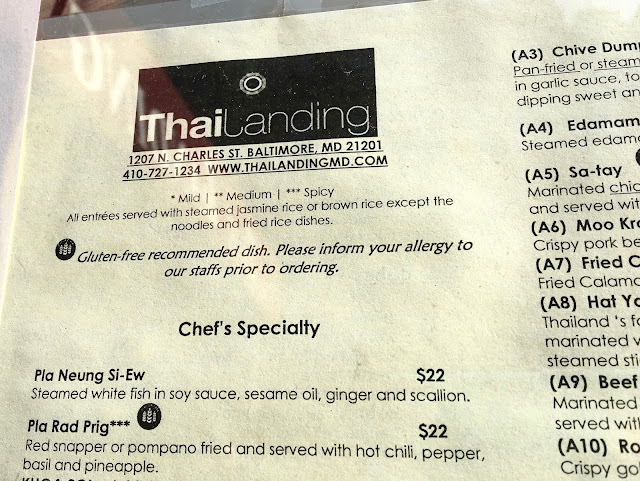 After scouring Google, I came across Thai Landing, a restaurant in the Mount Vernon neighborhood- just a few blocks from Penn Station. With marked menus to indicate gluten-free offerings, I decided to give them a try. Because I visited on the weekend, I could not take advantage of lower lunch prices. On all menus though, gluten-free options are marked, but they emphasize that you must inform the staff of any allergies to ensure that they can take care of you. Additionally, Thai Landing has a vegetarian menu (click here) where the dishes do not contain fish or oyster sauce. You can customize your order by spiciness, an choose which proteins (or veggies) to be in your dish. 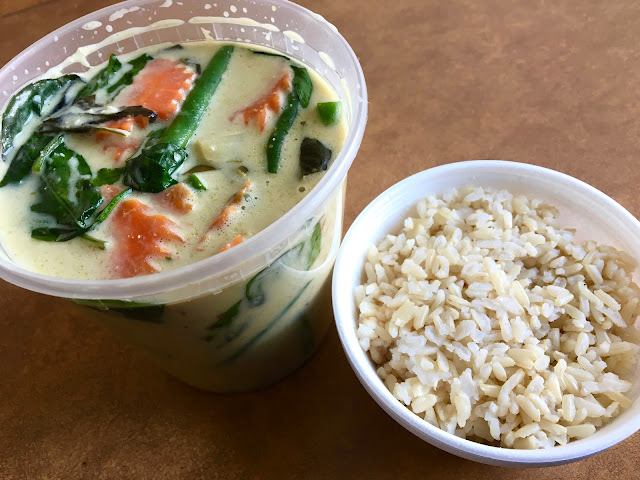 I ordered the green curry, my go-to dish when eating Thai food. I was impressed by the size of the portion, which definitely was an ample serving. The curry was good, a little milder than I tend to like though. The lemongrass-lime flavor and the creaminess of the coconut milk was good, but not the best curry I've tasted. The vegetables were in abundance, if a little undercooked, and the chicken was rather rubbery. The rice was good, and provided a nice texture and taste break from the curry. I always like it when I have the choice of brown rice because it provides a nice nuttiness that works well with the curry. Here's a size comparison of portions. My curry definitely scratched my Thai food itch, but did not overly impress me. While the meal was good, it wasn't overly memorable, especially in comparison to other Thai restaurants I have been to. While I won't be in a hurry to return, it's good to know that they can work around allergies and are gluten-aware.